"All of this was an accident," is how rose hybridizer Joe Winchel describes the beginning of his love affair with roses. He is best known for creating roses such as the hybrid teas Flaming Beauty, Dolly Parton, Jean de Tilleaux, Dallas Gold, Louise Estes, The Temptations, and Agnes Winchel, named for his dear wife, of course. Joe and Agnes Winchel were married in 1956 and bought a new house in Michigan in 1957. They hired a professional landscaper who brought plans and photos of previous jobs. They all included roses for both the front and back yards. "Well, I don't know anything about roses, so why don't we put something else in there," was Joe's first reaction. 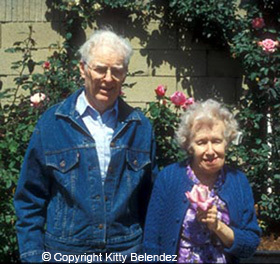 While trying to find a cure for aphids, he discovered and joined the American Rose Society. The ARS promptly sent a Consulting Rosarian to his house to help him eradicate the pests. Three years later, he joined a local rose society, and that fall he was given a rose hip with instructions on how to grow seedlings. He put the rose seeds in some wet spaghnum moss in a baby food jar, then put it in the refrigerator and forgot about it. When he remembered to check the jar, he found 3 seedlings had sprouted. Soon, he discovered he could grow rose seedlings in the basement under lights, and was growing 2,000 plants there until they could be moved outside in May. This system produced Flaming Beauty and Dolly Parton. In fact, one frosty February when snow blanketed the landscape, Joe was preparing to host the board meeting for the Detroit Rose Society. A bit of impishness took him down to his blooming basement, as he relates: "I picked a bowlful of rose petals and put them in the refrigerator. When Agnes served refreshments, she gave me this bowl of rose petals. I put some salad dressing on it, and it tasted pretty good!" In 1975, Joe and Agnes moved to Shreveport, Louisiana, where they found the weather hot and humid. When they came to California for the National Convention in June 1978, they fell in love with the mild climate. They went home, packed up the roses, and made the move to the home they currently own in Harbor City, California. The house is on a modest corner lot, where Joe uses every available space for roses. Each area has a purpose: he plants all his rose seeds and raises the seedlings in the front yard, puts grafted rose plants and cuttings in a section of the backyard, grows rootstock along the far side of the house, and parent plants for rose hybridizing are in the backyard, sideyard, parkways, and up the side of the neighbor's property. These rose plants produce 40,000 seeds per year! 1. Wait until AFTER the first spring bloom to begin hybridizing -- plants will be much more productive. baby food jar. The rose pollen, covered, will last up to 4 weeks in the refrigerator. 3. The rose pollen is applied to a prepared bloom (emasculated and "defrocked") with a camel hair or ox hair brush (synthetics don't carry the pollen as well). Joe doesn't label the pollen or hips with parentage. 4. The sepals are NOT removed until after the hips are harvested, as they are there to protect the developing hips from the hot sun. 5. He continues to hybridize through to the end of August -- these last hips will be collected in December, at planting time. 6. Hips are harvested when the STEMS begin to turn yellow or brown, for full maturity. 7. A blender is half-filled with water, hips (sepals and stems removed) are added to about an inch from the top, and the blender is turned on at medium to medium-high speed. The pulp is then sieved away (any seeds chewed up are not viable). 8. Joe never worries about the "float test." In Michigan, where July 4th is considered the end of pollination season, he had pollinated Lady X in August. "I took the hips and shelled the seed; I gave them the water test as I always did then, and every seed floated. Well, I planted them anyway, just to check and see. Almost every one of them grew, five were good enough to bud, and Dorothy Anne was one of those." 10. During October and November he removes the previous year's rose seedlings which didn't make the grade, and fumigates the soil with Vapam, covering it with plastic for 3 days. When the plastic comes off, he cultivates the soil with a rake, letting it "breathe," according to directions. 11. In December, the seed is cast over the soil and covered with 3/4 inch of Fison #3 For Seeds (available at McConkey's in Garden Grove). Fison is good for seeds that are difficult to germinate. It contains a wetting agent so it can be used dry and sprinkled with water after it is on the ground. 12. Seedlings are given up to a year to perform; the most promising are budded onto rootstock (he prefers the new "069" it doesn't mildew and is nearly thornless). 13. When budding, Winchel chooses a stem (still on the growing rootstock plant) of about pencil thickness and grafts the bud between two leaves. Then, immediately taking his cutting from the bush, cuts the stem to keep two leaves above the graft and one leaf below it; this lower leaf and its bud eye are removed before rooting the cutting. 14. To root rose cuttings, he has a new technique that is putting his mist propagator out of business: He removes a plug of earth from his planting ground with a circular bulb planting tool, mixes half of this soil with Redi-Earth potting soil (available at Orange County Farm Supply, and also McConkey's) and refills the planting hole. He makes a hole with a pencil for the cutting, dips the cutting in RooTone before planting it, and slowly waters it in with a watering can, careful not to wet the graft itself. Using a large opaque white "vitamin jar," he covers the cutting, twisting the jar into the soil a bit, "so it won't go nowhere." These are in direct sunlight but Joe says, "It's amazing how they don't get hot. So far, it's the most successful way of rooting that I've ever tried." He waters daily for 5 minutes right over the jars to keep the soil moist, and in about 4 weeks he removes the jars -- no hardening off! Once the bud eye has good growth, the top stem of the rootstock is cut completely away. When evaluating a new seedling, Joe looks for exhibition form first: "People in rose societies, people who grow a lot of roses, want form. It's got to have something unusual if it doesn't have form. And I like fragrance, but it's hard to get." Also, he points out that the petals should be as wide as they are long, and be broad at the base. If they are too thin, the bloom will open too fast and drop its petals. 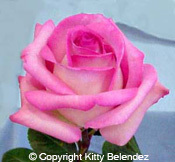 If a rose has been grafted but is not quite up to snuff, it is removed and (usually) given away. But Joe can still watch its progress in a neighbor's yard: "I've got some on the market that I had given to the neighbors. I decided a year or two later that they were too good to throw away, so I sent them to the growers and one of them even got into the AARS trials! (It didn't win, but not many of them do.)" One of Winchel's newest roses is Lynn Anderson, the pink and white hybrid tea that won the Silver Certificate at the ARS Test Gardens, the top award for 1993. Formerly known as "Omigod" because of its extremely tall growth habit, Lynn Anderson will be registered in time to be shown at the National Convention in San Diego in June 1994. Joe Winchel has already trophied with it in the "unregistered seedling" class at past shows. He advises, "If you want to exhibit Lynn Anderson, the best way is not to let it get over 4 feet tall. I got 2 -1/2 (5 gallon) bags of hips from 3 plants, so that is the reason I grow it as a climber." His current favorite is the new orange-red Ain't She Sweet, which will be introduced this year by Weeks. It is a good mother plant, has better form than its pollen parent, Dolly Parton, and a slightly different (but as much) fragrance. And it is fairly disease resistant. Donna Darlin', previously nicknamed "Wow! ", is another stunning new introduction for 1994. Joe describes it as "white and yellow with some dark pink or almost red, depending on the weather." As it ages, it gets a little black line around the outside edges of the petals (he almost named it "Eyeliner"). Coiner will have this one. Louise Estes is a pink with white reverse having very good form and foliage, which will probably be introduced late next year. Pearl is an exquisite, creamy white Hybrid Tea that came up with last year's seedlings and is now on its way to the Test Gardens. Usually, the introducers like to name the roses, but Joe was firm on naming this one "after my mother, my sister, and my niece." The name, as well as the honor, certainly suits this rose. These are just a sampling, of course. Joe has many others which haven't even been named yet! He has 33 different varieties submitted to the AARS Trial Gardens just this year . Joe Winchel was a guest speaker at the National Convention at San Diego in June 1994. 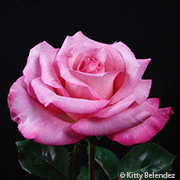 He plans to present a slide program on rose hybridizing which is certainly NOT to be missed. When asked about his goals for the future, this octogenarian responds, "I'll hybridize 'til I'm 102 and by then, hopefully, I'll have an AARS Award winner. And Agnes, she's going to live forever, so SHE can spend the royalties on that one!" For more info see HOW TO GROW ROSES FROM SEED. © Copyright Kathy DeRoo. All rights reserved. This article was originally published in "Rose Ecstasy," bulletin of Santa Clarita Valley Rose Society, Kitty Belendez, Editor.